Biology II students at Exeter-Milligan have been studying the various systems of the human body. Currently we are on the Urinary system. As part of the class, we were able to dissect pig and sheep kidneys to review the main parts of the kidney. We will soon be modeling the process of urine formation to understand the function of this system. We will then move on to the nervous system where we will be able to dissect a sheep brain. 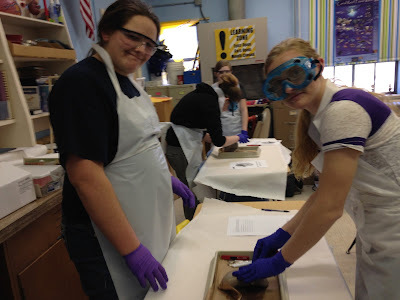 Pictured are Tara Mueller and Hannah Horne dissecting a sheep kidney.